The city of Detroit is the largest city in the state of Michigan, it’s world-class industrial powerhouse and the fourth largest American city by the mid 20th century. 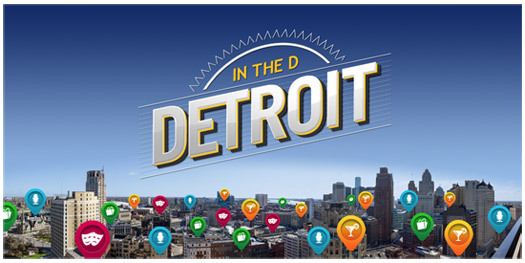 I believe it is important to find information about the city’s famous attraction downtown Detroit. Downtown Detroit is the central business district and a residential area of the city of Detroit, Michigan, United States. Detroit is the major city in the larger Metro Detroit region. Downtown Detroit is bordered by M-10 (Lodge Freeway) to the west, the Interstate 75 (I-75, Fisher Freeway) to the north, I-375 (Chrysler Freeway) to the east, and the Detroit River to the south. The city's main thoroughfare M-1 (Woodward Avenue) links Downtown to Midtown and New Center. Downtown contains much historic architecture and many of the prominent skyscrapers in Detroit, including the Renaissance Center, the Penobscot Building, One Detroit Center, and the Guardian Building. Historic churches, theatres, and commercial buildings anchor the various downtown districts. Downtown has a number of parks including those linked by a promenade along the International Riverfront. Its central square is Campus Martius Park. Mapping together buildings in the area using Neatline to organize the data on my website. You will be able to click on a destination and pull the information up as well as photos. I have created a layout of the most historical buildings downtown. I will have an abundance of research dating back to how the building came about, their names and what they are used for now. Hope you enjoy!